After three months of anticipation, the original iMac G3 goes on sale. 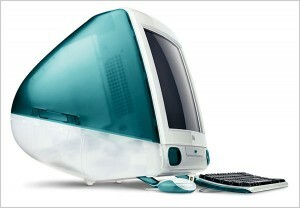 The “Bondi Blue” iMac became well-known for its colorful case, which bucked the industry norm beige. However, it is also known for being the first commercially successful computer to eliminate the use of legacy ports and the floppy drive. Widely criticized at the time for not including the older technologies, by only featuring USB ports for peripheral connectivity, the iMac helped popularize the emerging standard, even on Windows PCs. And when was the last time anyone saw a beige PC?